Today Samsung uncovered its latest rugged smartphone with the Galaxy Xcover 2. A follow-up to last year's Galaxy Xcover, the Galaxy Xcover 2 is built for the outdoors with a dust and sand proof case. The battery cover also has a lock mechanism to prevent it from popping off when dropped. The case is water resistant up to one meter, which goes along with the 5-megapixel camera that can now operate underwater. The Galaxy Xcover 2 also has a GPS enhanced with a global navigation satellite system which Samsung claims offers 20 percent more accurate location tracking. 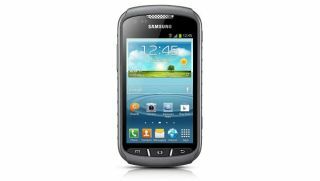 While the Galaxy Xcover 2 is well-equipped for the elements on the outside, the inside is a fairly standard mid-range handset with Android 4.1 Jelly Bean. The 4-inch WVGA display is covered in Gorilla Glass for added protection, packing inside a 1GHz dual-core processor, 1GB of RAM, and 4GB of memory that can be expanded with a microSD card by up to 32GB. The rear 5-megapixel camera also has an LED flash, which can double as a flashlight, while the front of the smartphone also has a VGA camera. Most of the Galaxy Xcover 2's specs were revealed earlier this month through Samsung's leaked 2013 mobile roadmap, which also let us know that Samsung plans to launch the rugged smartphone in February. Today's announcement didn't elaborate on those launch plans, but with MWC 2013 around the corner this likely won't be the last heard from the Samsung Galaxy Xcover 2.